Timbaland featuring Keri Hilson & D.O.E. Send me your email address and I'll send you and invite to obopay.com so that you can get a prepaid debit card with five dollars on it. Send now, and then you will be able to get your friends to join as well. All you need to do is have a mobile phone number to sign up and verify your identity. Send email addresses now if interested. Similar to the promotion ebay ran when they first started. The blogs are definitely watching a lot of celebrities nowadays, so celebs watch. 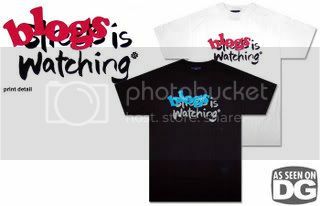 Make sure you get yourself a "blogs is watching" tee today at Digital Gravel. It's definitely time for a change when it comes to this blog, but the problem is I don't have a lot of time to work on it. I guess I've have to make time real soon because a change is due. I just heard about this new song that features Chris Brown and T-Pain. You know its gone be hot if T-Pain on the song. right. Well, just check out this song for yourself, and you give me your opinion of it. Well, Beyonce is the next celebrity to be featured in a AMEX commercial,so their looking for new faces.